While I'm no expert on Ghana... I have learned one thing. Their traditional music is much more varied and beautiful than ours. 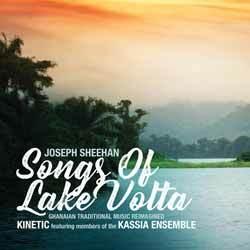 Sheehan explores some of the countries rich musical heritage here on Songs of Lake Volta. Between 2013 and 2017 Sheenan made a number of visits to Ghana in other to further explore the country and its music. The intensity of these studies resulted in the release of the 2014 album, World of Wonder. Songs of Lake Volta is a genre-bending album that challenges the persistent notion of drumming being the sole outstanding feature of traditional African music. Kinetic, which Sheehan founded, is comprised of five musicians who strive to break down barriers between traditional music genres and audiences. The newly-formed Kassia Ensemble is an all-woman group came together to supersede the gender barrier that is prevalent in classical music. Vocalist Anqwenique Wingfield sings in various indigenous languages and styles representative of Ghana’s ethnic diversity. The album draws its main inspiration from the genres of West African, classical and jazz - and the end result is mesmerising. The album contains 9 songs (51 min, 24 sec) and will certainly open your eyes and your heart to a world you might otherwise have missed.